An important discussion for most software companies–both in the software product planning stage and in the downstream active software product marketing phase–is the manner in which the product will be marketed. The decisions to be made in each of these phases are separate, but closely related. The discussions on this topic need to happen regardless of whether you are marketing a traditionally licensed application, an open source application or a SaaS application. One of the more important aspects to this is whether the product will be aimed tightly at one or several vertical segments, or marketed more broadly to the widest possible audience. This is the crux of the vertical vs. horizontal marketing decision. Let’s examine a few topics which can be useful in framing this discussion. How specific is the “language” of your application to a vertical audience? This is very important because in some product categories the unique business processes of a vertical can be very important, while in other product categories there is great commonality in process and language across industries. If you’ve written your application specifically to solve one market segment’s unique problem, it’s probably VERY specific. When this is the case, it’s pretty obvious that you’ll start (and possibly end) with a highly vertical marketing effort. Sometimes as thing go along you may find that you’ve solved a problem for market A, but the product is also useful in market segment B and C–although there often needs to be at least some modification. If you’ve solved a more generic problem that applies to many markets, the decision to market the solution horizontally or vertically can be much less clear. How big is your overall software market? This is a key consideration when you’re entering a new market with a new product. The larger the market the more likely it is that you will need to take a vertical approach get initial traction. In many cases this means verticalizing the product in the product development phase. But even if there isn’t a strong set of vertical needs with respect to product features and “language”, in large markets a vertical MARKETING approach may be required to build market traction. It is often far easier to build a brand name and market traction in a tight vertical prior to moving on to the next segment, than it is to take a more scatter-shot approach with no vertical focus. What is the level of competition in the overall market? This question is closely related to first question above, as strong competition often goes hand in hand with large markets. They are separate issues, however, and should be evaluated individually. If the level of competition is high, regardless of market size, a new entrant is likely to have a better chance of success with a more vertical approach. It there isn’t significant competition in your chosen segment(s), you may be able to have success with a horizontal approach across several market segments , which if practical can be a more efficient way to use both product development resources and software product marketing dollars. Market maturity: has the overall market verticalized already? Regardless of the level of competition and the market size, if the larger market has already evolved into a number of vertical sub-markets, it may be too late to take a horizontal approach. It is usually very difficult to defeat entrenched verticalized competitors when entering a market with a horizontal application. The exception to this would be a new competitor with a product that provides a quantum leap forward in functionality (usually as a result of a technological paradigm shift) or a huge brand name. What level of software product marketing resources are available? The level of software product marketing dollars available to you are quite important in formulating your approach to the vertical vs. horizontal question. As one example, let’s say you are entering a market that is large, quite competitive and you won’t have a lot of marketing budget available. In this case, it would be very important to develop the product upfront with the strongest vertical focus possible and market it accordingly. On the other extreme, you might be entering a market of modest overall size that hasn’t verticalized to a great degree to date and you are well funded — enabling a substantial marketing budget relative to the competition. It this case it might be an easy decision to take the ROI-efficient horizontal approach both from a product development and promotional perspective. There are many potential scenarios that lie between these two extremes, which unfortunately will lead to less obvious decision-making. Is your software product a “point” or “platform” application? Most software applications are “point applications”, meaning they have little or no native integration with the rest of the customer’s software infrastructure. In addition, any possible customization is generally intended to be done by the application vendor themselves or maybe their channel partners. by adding “vertical” functionality not present in the platform software, thereby enabling a complete solution for a specific vertical market. In this way a platform software application allows a software vendor to “have its cake and eat it too” with respect to the Horizontal vs. Vertical software product marketing discussion. The platform software itself provides basic functionality which can be sold broadly across many markets, while the open APIs enable the product to be tightly customized for specific verticals as required, by both your channel partners and independent ISVs. The platform application can be a product manager’s dream and is the Holy Grail of software when it comes to efficiently serving as many market segments as possible by leveraging partner investments. But it’s not something that can be forced; there needs to be a natural reason for the platform to exist, or there will be no third parties willing to write the add-on applications so critical to the platform’s success. Without these add-on developers a platform will more often than not die a quiet death in the marketplace. 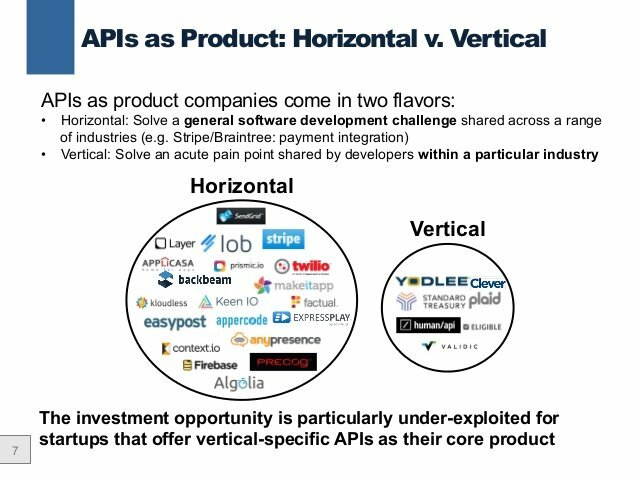 In summary, when you write an application which aimed at a problem specific to a single vertical market, the answer to this “vertical vs. horizontal” software product marketing question is often easy. In many other cases you’ve created a product which is useful across several market segments–but do you have the resources to attack multiple market segments simultaneously? How do you approach this common problem? Leave a comment below with your take on this topic or shoot us an email with your questions. Too often software companies base these decisions looking inside-out. The main factor should be customers, their problems, how do they use, what do they have in common. Well, what are your thoughts on how pricing is impacted with this vertical vs horizontal marketing decision? I think that say for a software startup, software product pricing strategy is intertwined with the ‘horizontal -vs – vertical’ marketing decision. In vertical marketing strategy, there is a closer client & partner association(s) and the higher ‘perceived’ value can drive the price northwards at times beyond competitive ranges. However, in horizontal markets, competitive pricing and penetration compulsions do not allow as much flexibility say for ‘value based pricing’.